Prompt, Professional Treatment For Your Pain...That Will Get You Back On Your Feet Fast! 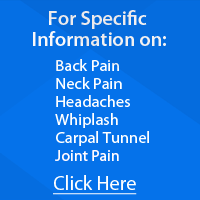 Gentle and effective care for your back or neck pain without using drugs or surgery. Whether you woke up this morning and can't put your socks on, or you've had nagging pain for weeks (or months) and are fed up with it. We can let you know if our gentle solutions are right for your specific condition...or let you know what step you should take next. Either way...we will listen to all your concerns, and you will get a professional exam with an explanation of what we found. If you require any addional testing, we will let you know right away.